Preliminary offensive: the taking of hill 470. Hill 470 was “a kind of pier head, like the prow of a ship that dominated the whole of the Bel Monte valley“. The Germans had concentrated a significant number of men and artillery there. It was therefore indispensable to take the hill in order to protect the advance of 11th Company in the Gandoet Ravine. If hill 470 was not taken, the Germans could easily shoot the French soldiers climbing the Gandoet Ravine in the back. 9th Company assembled 200 metres to the south of Valleluce at 4.30 in the morning. It had initially been decided that the 4th R.T.T. should be relieved at its starting point by the 3rd R.T.A., but the 3rd R.T.A., having been forced (like the 4th R.T.T. before it) to make a 24 hour march, was late. Gandoet decided, in spite of that, to launch the assault with Captain Denée’s men at the time set. The reserves of cartridges and grenades were divided among the men, who were given the order to leave at around 5.00 a.m.
At 5.40, the artillery at a lower level, under the command of Dunois, began its operations that were intended to cover the 9th Company (155 mm guns). The shelling lasted for 20 minutes. At 6.00 a.m., the French artillery stopped firing after pounding the German positions, and four squadrons of Marauders bombed their targets particularly hills 721 and 681 (objective O1), as planned. The end of the artillery fire and the passing of the bombers gave way to a silence that was the signal for the 9th to begin their assault. Denée launched his men. It was 6.30 a.m. First of all they descended the slopes of hill 502 as far as hill 350 at the foot of hill 470. 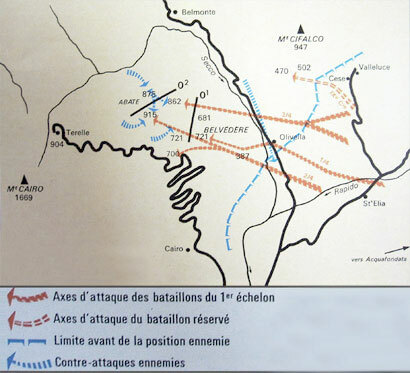 Lieutenant Spiroux’ section split off from the rest of 9th Company and moved towards the base of Monte Cifalco. Captain Denée’s men then climbed hill 470 in order to cover the advance of the 11th Company towards the Rapido. The Germans positioned on Cifalco then began to shell 9th Company fairly quickly. The riflemen had to run, seize the German structures by hurling grenades and then kill the enemy with their bayonets. Denée advanced with the 3rd section under the command of Lieutenant El Hadi. Visibility was poor. Father Bérenguer, the priest, was at Captain Denée’s side. 9th Company quickly suffered very heavy losses. The 2nd section lost its leader, Staff Sergeant Laurent. Denée’s orderly, Mohamed Tahar, was shot in the face. Sergeant Gibou was ripped open from the hip by a bullet and suffered a gaping wound. Staff Sergeant Daubricourt, Staff Sergeant Jaine, Staff Sergeant El Hadi, Sergeant El Hadi and Corporal Martini were all wounded. The Germans on the Cifalco shot at random, blindly, trying to hit the French H.Q.s. The French artillery then resumed shelling, directing its fire at the Cifalco which was completely blinded by the smoke. Denée continued his advance with grenades and bayonets. At 9.00 a.m., Denée estimated that they were in range to launch the final assault on the summit of hill 470. The men rushed forward as if rising from the earth. Now we could seem them. The landscape, only recently strangely empty, was suddenly full of people. A swell of helmets, of bent backs, stooped shoulders, of arms and hands gripped on the wood and steel of weapons, frenzied legs in khaki trousers, held tight in gaiters with stirrups, rolled like a wave bristling with glinting bayonets, criss-crossed with flashes from pistols and submachine guns. Then the hand to hand fighting began. At 9.30 a.m., Denée fell riddled with bullets and passed the command to Lieutenant El Hadi ben Kacem ben Battab. By this time 9th Company had lost half its men. El Hadi lost his lower arm but continued the advance and threw himself into the hand to hand fighting for another half hour. Lieutenant El Hadi, with his mutilated arm and his uniform soaked with blood became a kind of living flag who spread terror among the enemy. He yelled and thrashed about, shooting all around. Everyone could see his intrepid form brandishing his only good hand above the swirling combatants, who were now fighting with bayonets, at close range. El Hadi was also riddled with bullets at the summit of hill 470. Rifleman Barelli executed El Hadi’s last order, which was to fire a red flare with two flames which signalled that hill 470 had been taken. El Hadi managed to get back up and shout “Long live France” at the enemy, before he breathed his last and died. 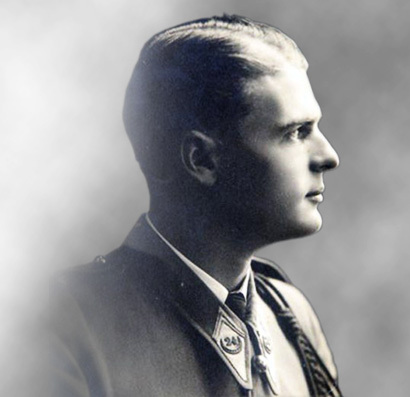 It was 10.30 a.m. Only one officer was still alive: the Cadet Koeltz, the son of General Koeltz, who was aged 20. At midday, his legs were smashed by a burst of machine gun fire. The 9th Company no longer had any officers to lead it. Lieutenant Spiroux arrived soon after and took command of the men who had survived. He gathered the survivors together and held hill 470. It was midday. Meanwhile the 11th Company, protected by the assault on hill 470, crossed the Rio Secco in icy water. Next it had to get through the barbed wire entanglement set up by the Germans. Lieutenant Jordy, in command of the 11th Company, ordered Sub-Lieutenant Tumelaire’s section to move forward, which it did taking two blockhouses. Jordy then launched the Chol section behind that of Tumelaire. Then it was the turn of the Coudrin section. Tumelaire was the first to enter the Gandoet Ravine with his section. They advanced in single file, followed by Chol’s section. The Germans responded energetically, firing from Cifalco and Campo Piano. Lieutenant Jordy, seeing the danger, put the 60 mm mortars in a battery which then pounded the German positions in reply. It took at least five hours to climb the Gandoet Ravine, which gives an idea of the men’s stress and fatigue when they reached the summit. The Ravine culminates in two mounds at 315 and 382 metres. There were blockhouses and walls made of sandbags which were held by the Germans. Jordy, walking at the head of his men, decided to launch them on the base of hill 681. He launched Tumelaire’s section. They were 300 metres from O1. It was around midday. Jordy then put the two mortars in a battery which had been hauled up to the summit of the Gandoet Ravine. Tumelaire spotted the blockhouse at 350, which was taken at 4 p.m. Tumelaire took seven prisoners with the help of Corporal Robert, aged 17. The prisoners belonged to the 131st Pomeranian Infantry Regiment. Meanwhile 9th Company was under fire. The Germans launched a counter-attack against Denée’s men at 1 p.m., in order to retake hill 470. 9th Company did not withdraw but the men were picked off one by one. Finally, when there were only 18 survivors, with no officers, the men beat a retreat. Gandoet himself stepped in begging them to hold on as long as possible. Gandoet was then helped away by Captains Louisot and Jean who stopped half way down the south side of the hill 470, where they set up two strongpoints. At the same time, 11th Company was gradually emerging from the Gandoet Ravine. Jordy was able to see very little of the Ravine’s best exit as the Germans on Cifalco were raining shells on the exit and a blockhouse at 382. He called Gandoet in vain to get support from the artillery. Fortunately, Louisot picked up Jordy’s call. He was still further down on the other side of the Rio Secco, south of hill 470. Louisot had a good view of the summit of the Gandoet Ravine and was able to guide Jordy from a distance. The 11th Company took two other blockhouses. Louisot informed Jordy of the blind spots for anyone on Cifalco and thus played a very useful role. The fact that he was further away enabled him to give precise instructions to Jordy’s men. Sometimes he got them to descend when the path was too steep and he was able to point out a better route. The advance of the 11th Company had become an exercise in mountaineering. The men were no longer able to stand upright and had to climb the rocks on all fours. The riflemen-mountaineers had become easy prey for the German snipers. The climb was unbelievable. The physical and moral effort required was at the limit of human endurance. It was more than a man could bear. Riflemen, not wounded by any bullets, suffered fainting fits due to cardiac suffocation and muscular exhaustion. They had to stop to fight against the dizziness, to hold on desperately on the edge of the void. Then hill 681 was taken. Staff Sergeant Le Greves seized a machine gun and killed a German officer. A final blockhouse was taken by 11th Company. It was an important success for Jordy, Tumelaire and Chol. Gandoet congratulated 11th Company for taking hill 681 (O1) by walkie talkie (set 536). The Company was now occupying hill 681 and part of the northern slopes of hill 721. Jordy asked for reinforcements. Meanwhile the 2nd Battalion had taken hill 382 and the southern slopes of 721. Olivella was still in French hands. The two sets of artillery shelled each other incessantly until 11.00 p.m. The French and Germans removed their wounded in the night. They crossed each other’s paths in no man’s land and, out of respect for the rescue operations, observed a ceasefire. Two sections from the 10th Company, one led by Bouakkaz and the other by Lieutenant Nicolas, met up with Jordy at 1.00 a.m.
_ Was it very tough? _ You could say that. But then, I’m very strong, aren’t I. No Jordy, no one will ever know what we did. No one will ever suspect …. Things like that are indescribable. It will fade with us. Frenchmen in France will never know anything about it. Ah! if it hadn’t been for you! …. Then the men tried to sleep until the morning – the 26th, the date set for the O2.